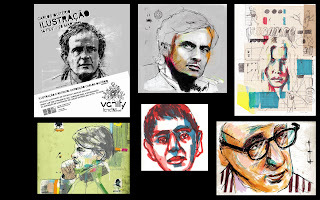 These are some portraits by an illustration graphic artist called Carlos Quiterio. Quiterio's rough mixed media style attracted me to his work and i felt the style would suit my brief, to design a illustration based magazine cover for the little white lies. The way he combines his hand rendered pieces with digital elements gives off a sketchy effect that i think would work well for the type of movie drive is. As its a rough fil set in the 70's and rarely leaves the L.A city location and the film carries a real stylish feel of emotion throughout the film.